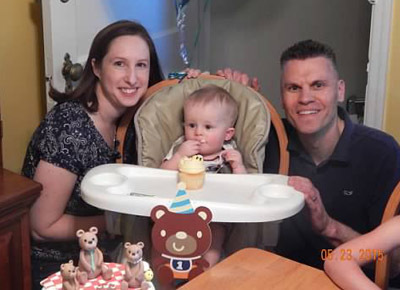 Betsy and John Scafidi with their son at his first birthday party. Like many couples who have had trouble conceiving, Betsy and John Scafidi found hope and healing with NaPro Technology. The couple married in October 2004 but did not conceive their first child until 2012. It was then that they turned to NaPro Technology under the suggestion of their friend who happened to be an archdiocesan priest. They met with Barbara Rose, nurse practitioner and fertility care practitioner who taught them the Creighton Model FertilityCare system. Rose referred the couple to Dr. Jean Golden Tevald of MorningStar Family Health who diagnosed the root cause of the infertility, a hormonal imbalance. Along with careful, daily charting, Scafidi went through a series of blood work and ultrasound tests to diagnose the underlying cause of their infertility. After all the data was collected it was clear that although Betsy’s progesterone was within normal range her estrogen level was clearly elevated. The difference between the two was a concern and could potentially lead to future miscarriage. Within four months of their first visit to Dr. Jean, John and Betsy conceived and were instructed in treatment and monitoring to help them have a successful pregnancy and birth. For the first two months Betsy needed progesterone shots twice a week. This was then reduced to once a week and by late October of that year she was getting blood work down to once a month to be sure everything was still within the expected range. Now the Scafidis are enjoying the blessing of their son Dominic, who just turned 1 in May. “I am so thankful for NaPro Technology,” Betsy said. “We went through the darkest time of our lives with the loss of our first baby, but learning about NaPro and FertilityCare has been a great gift from this sad event. We want to take the opportunity to tell as many people as we can that there are answers to infertility and early loss. “Many early losses can be avoided with the help of charting with the Creighton model and a trained NaPro physician and no one should accept the answer, ‘that just happens sometimes,'” she said. There are free group introductory sessions of the Creighton Model FertilityCare system every month in Bucks, Montgomery and Delaware counties. To locate a session and register, visit fertilitycarefriends.org.